With a stay at Aava Resort And Spa in Khanom, you'll be on the beach and 3 minutes by foot from Khanom Beach. Featured amenities include dry cleaning/laundry services and a 24-hour front desk. For a surcharge, guests may use a roundtrip airport shuttle (available on request) and a ferry terminal shuttle. Located in Wang Nam Khiao, Wangnamkeaw In Love is within a 15-minute drive of Wat Bu Pai and Pha Kep Ta Wan. The front desk is staffed during limited hours. Free self parking is available onsite. 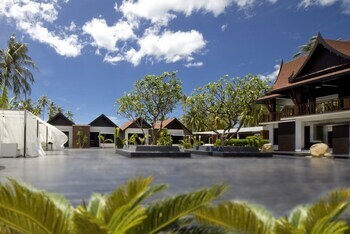 When you stay at Naraya Lanta Resort in Ko Lanta, you'll be convenient to Khlong Toab Beach. Free self parking is available onsite. With a stay at this villa in Cha-am, you'll be within a 10-minute drive of Wat Bo Fai and FN Factory Outlet. Free self parking is available onsite. Located in Cha-am, Dee-Lek Guesthouse and Restaurant is a 2-minute drive from Cha-am Beach and 9 minutes from Cha Am Hospital. The front desk is staffed during limited hours.